Spread the word! We have an opening for Principal Horn, and the runner-up will be offered the Third Horn position. Auditions will take place on Tuesday, September 6, and you can call to schedule your audition appointment beginning in August. TIME: 6:45–10pm, by appointment. 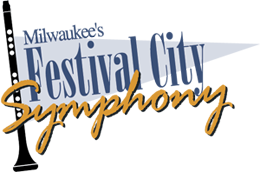 Call Festival City Symphony at 414-365-8861. We will be scheduling audition appointments in AUGUST. PLACE: Milwaukee Youth Arts Center (MYAC), 325 W. Walnut St., Milwaukee, WI 53212. MYAC is located on the southwest corner of Martin Luther King Jr. Dr. (Third St.) and Walnut St. (Pleasant St. to the east). Brahms, Symphony No. 3, 3rd mvt. Haydn, Symphony No. 31, 2nd and 3rd mvts. Shostakovich, Symphony No. 5, 1st mvt. Tchaikovsky, Symphony No. 5, 2nd mvt. 3. There may be sight reading. CONTACT US AT: 414-365-8861 or festivalcitysymphony@wi.rr.com.